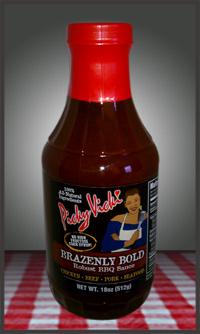 Picky Vicki (Bel Air, MD) is the maker of 100% all natural BBQ sauces. Vicki, a former restaurateur, took to the road in 2007 to promote her thick tomato sauces and rib rub. She and her crew have been at it ever since, working various food competitions and festivals. Vicki was kind enough to send samples of each of her four signature flavors. The first bottle I opened was Brazenly Bold. 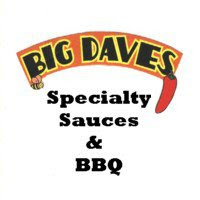 Vicki describes this particular sauce as having a "robust" flavor with a habanero chili base. The dark red sauce is packaged in 18 oz. glass bottles. It's incredibly thick with a slightly gritty texture and pours very slowly. Though Vicki is no Midwesterner, Brazenly Bold reflects the characteristics usually associated with Kansas City / St. Louis style sauces. The thick tomato sauce is accented with vinegar, brown sugar, molasses and liquid smoke in addition to the aforementioned habaneros. The strong flavor profile is, however, a bit more tangy and spicy than most KC sauces. Since Vicki's former restaurant was called Ribs n Things, I figured her sauce was meant for pork ribs. I therefore used Brazenly Bold on smoked spares. I brushed the thick sauce on a couple of racks as they finished in the smoker. Though the sauce gave the ribs good color, it didn't quite create the smooth glossy finish I prefer. The heat mellowed the sauce as is often the case. The brown sugar and molasses caramelized a bit in the smoker. The result was a pleasant, not too spicy compliment to the ribs. Though the flavor still held up, it wasn't overwhelming. I was able to serve the ribs to my wife and grandparents without complaints about the spice. The sauce's extreme thickness somewhat limits it's use. The flavors paired well with pork ribs and I suspect it would equally compliment beef and chicken. The gritty texture doesn't present quite as well as other grilling glazes, but the flavor is quite good. It's a good choice for those who prefer rich, bold flavors and enjoy a bit of heat. Check out Picky Vicki's website for more info. See how Brazenly Bold rates on our "Product Reviews" page. 0 Response to "Picky Vicki Brazenly Bold Robust BBQ Sauce"